UNIQUE MUSIC BOX: Original hand crank Music Box, just turn the handle and it will play this well-known tune. 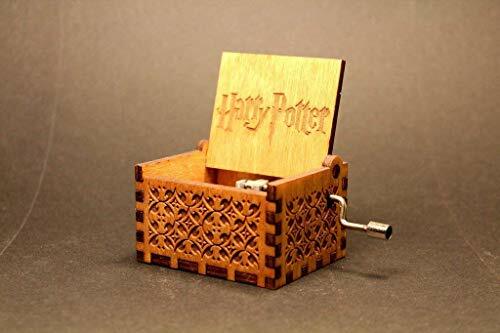 WOODEN BOX: Each music box is lightweight and portable and can be placed wherever you please. This box is also beautifully-carved and serves as an excellent conversation piece. HAND CRANK - this unit plays the 18 note song only while you turn the handle, playing the song in a steady but slow pace lasts about 30 seconds, and then you can repeat it! PERFECT SIZE - designed to be small so that it easily fits in the palm of a child's hand, unit measures 2.5" x 2.0" x 1.75", slightly smaller than the credit card you are holding in your hand! WOODEN BOX: Each music box is lightweight and portable and can be placed wherever you please. This box is also beautifully-carved and serves as an excellent conversation piece.